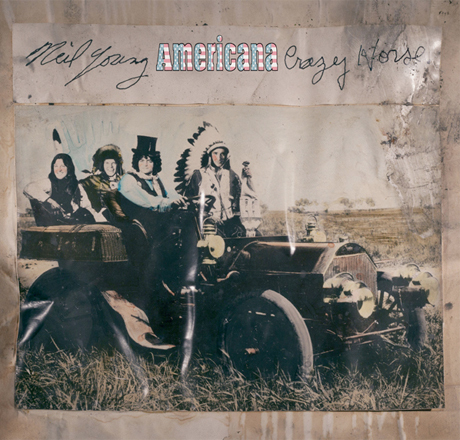 Earlier this year, Neil Young fans had reason to be excited with news that the rock'n'roll legend was once again recording with his proto-grunge partners in Crazy Horse. Now, we're happy to confirm that the collaborators have completed a new album called Americana, which will be released on June 5. Americana is the first album Young has recorded with Crazy Horse since 2003's Greendale, and the first time the full lineup of Billy Talbot, Ralph Molina and Frank "Poncho" Sampedro has worked together since 1996's Broken Arrow. What ties these songs together is the fact that while they may represent an America that may no longer exist. The emotions and scenarios behind these songs still resonate with what's going on in the country today with equal, if not greater impact nearly 200 years later. The lyrics reflect the same concerns and are still remarkably meaningful to a society going through economic and cultural upheaval, especially during an election year. They are just as poignant and powerful today as the day they were written. We're guessing that means we can expect a hefty dose of distortion and elongated guitar solos, but that will be seen for sure when the album drops in three months. For now, the full tracklisting is available below.